Spiced Potato Patties from Sindhi Cuisine. soak the slices of bread in water. squeeze out the water from the bread completely. mash the bread. add this mashed bread pulp to the mashed potatoes. mix the aloo tikki mixture well. take a small ball from the mixture. flatten the ball and shape into tikkis. make 7-8 tikkis and keep aside. shallow or deep fry the tikkis in hot oil. i fried them on my nonstick tava. i used 2 tbsp oil to shallow fry them. fry on a medium flame so that the tikkis do not get burnt. when one side is browned, turn carefully and fry the other side. when both sides are crisp and browned, remove the tikkis from the tava. if you want a more crispier crust, then arrange the aloo tikkis which are done on the edge of the tava. heat some oil in the center of the tava and fry new tikkis. keep the fried tikkis on crumpled kitchen tissues so that they absorb excess oil. 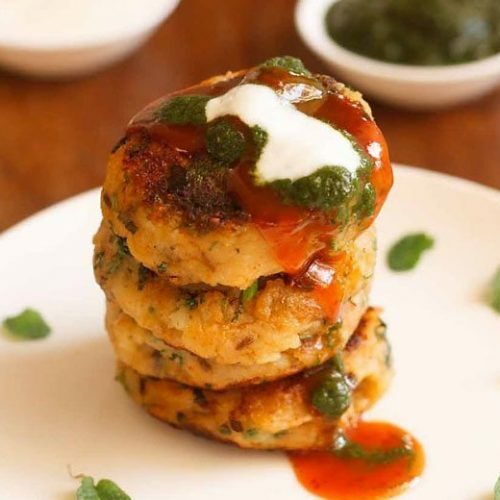 serve sindhi aloo tikki hot with chutney, tomato ketchup or sweet curd. you can also serve tikkis with chole. If the aloo mixture is not firm, then add some more bread. As a test, you could fry one tikki to see if its breaking or not. If it breaks, then add some more bread to the tikki mixture.